“We humbly ask you, almighty God: be pleased in your faithful love to + bless the salt you have created, for it was you who commanded the prophet Elisha to cast salt into water, that impure water might be purified. Grant, O Lord, we pray, that, wherever this mixture of salt and water is sprinkled, every attack of the enemy may be repulsed and your Holy Spirit may be present to keep us safe at all times. Through Christ our Lord. Amen. Here it would appear that the legislator’s aim in using the expression “if this rite is celebrated during Mass” is directly related to the omission of the penitential rite. While it is true that the expression “within Mass” is redundant, as this is obvious from the context, I doubt very much if it has anything to do with the possibility of whether this rite is possible outside of Mass. The legislator would not use the missal to implicitly make rules for other contexts. Indeed, confirming this interpretation we find the possibility and the rules for celebrating the rite of blessing and sprinkling of holy water outside of Mass contained in another liturgical book, the Book of Blessings. “1388. On the basis of age-old custom, water is one of the signs that the Church often uses in blessing the faithful. Holy water reminds the faithful of Christ, who is given to us as the supreme divine blessing, who called himself the living water, and who in water established baptism for our sake as the sacramental sign of the blessing that brings salvation. “1389. The blessing and sprinkling of holy water usually takes place on Sunday, in keeping with the rite given in the Roman Missal. “1390. But when the blessing of water takes place outside Mass, the rite given here may be used by a priest or deacon. While maintaining the structure and chief elements of the rite, the celebrant should adopt the celebration to the circumstances of the place and the people involved. “‘Let us pray.’ All pray briefly in silence, then with hands outstretched, the celebrant says the prayer of blessing. “Blessed are you, Lord, all-powerful God, who in Christ, the living water of salvation, blessed and transformed us. Grant that, when we are sprinkled with this water or make use of it, we will be refreshed inwardly by the power of the Holy Spirit and continue to walk in the new life we received at baptism. We ask this through Christ our Lord. R/ Amen. “Lord, holy Father, look kindly on your children, redeemed by your Son and born to a new life by water and the Holy Spirit. Grant that those who are sprinkled with this water may be renewed in body and spirit and may make a pure offering of their service to you. We ask this through Christ our Lord. R/ Amen. “O God, the creator of all things, by water and the Holy Spirit you have given the universe its beauty and fashioned us in your own image. R/ Bless and purify your Church. “O Christ the Lord, from your pierced side you gave us your sacraments as fountains of salvation. R/ Bless and purify your Church. “O Holy Spirit, giver of life, from the baptismal font of the Church you have formed us into a new creation in the waters of rebirth. R/Bless and purify your Church. “1399. After the prayer of blessing, the celebrant sprinkles those present with holy water, as a suitable song is sung; as circumstances suggest, he may first say the following words. Although similar in structure there are clear differences between the rites within and outside of Mass. Within Mass there is no Liturgy of the Word, as that will follow later. The prayers are also different, since those contained within the missal make explicit reference to the day being Sunday the Easter Mystery as the case may be. For these reasons I would say that the rite found in the missal should not be used outside of Mass but rather the rite found in the Book of Blessings. There may, however, be one exception: the blessing and use of salt. There is no mention of this rite in the Book of Blessings. The missal, as we have seen above, mentions: “Where the circumstances of the place or the custom of the people suggest that the mixing of salt be preserved in the blessing of the water, the Priest may bless salt, saying: […].” The prayer used is not tied to the Sunday or the liturgical season. I think that this rubric would allow for the introduction of the rite of blessing and addition of salt if the circumstances or the custom of the place suggest it. In other words, in any place where salt would be mixed with the water whenever the rite is celebrated on a Sunday within Mass, it could also be done if holy water is blessed outside of Mass. While I am not an expert in the Eastern liturgies, and it is true that the rite of peace is seen more in the context of Matthew 5:23-24, it is also noteworthy that the Roman-rite concept of the peace coming from Christ and the altar is not absent. Placing the kiss of peace after the offertory is also found in other Eastern liturgies. 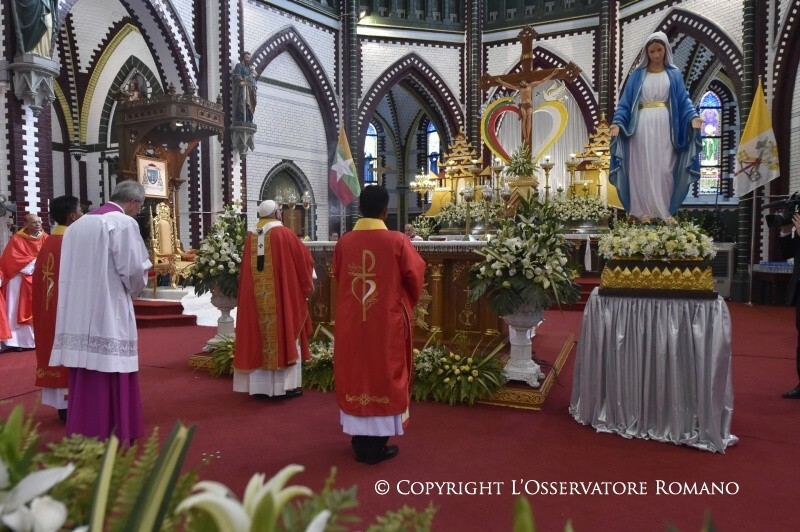 For example, the East Syrian tradition of the Syro-Malabar Qurbana (Mass) uses the very ancient anaphora of Addai and Mari, and places the kiss of peace at the beginning of the Eucharistic Prayer. The point is, I believe, that none of the venerable rites of the Church see the exchange of the sign of peace in merely human terms but as a gift that comes from Christ. The chaos that some of our readers have occasionally observed in the Roman rite stems, I suggest, from the faithful’s having lost sight of this essential point: that the peace we exchange is fundamentally Christ’s gift and a fruit of his sacrifice.